Help support women filmmakers by donating to Cady's Indiegogo campaign! Venice the Series' Season 5 was released on October 15, 2016, starring Cady and many other soap stars. Watch this episode for free now! Cady McClain will spend her upcoming birthday in a meaningful way. "On October 13th at 9 a.m., I'm introducing the Los Angeles Mayor at City Hall in downtown LA for Domestic Violence Awareness Day, with a focus on elder abuse," she reports. "The police chief will also be present, as well as members of the Domestic Violence Task Force. The idea of the event is to honor those who work in the field and bring more awareness to the issue." CADY MCCLAIN TO QUEENS OF DRAMA? Cady McClain (ex-Kelly, Y&R et al) revealed on social media that she met with the team at QUEENS OF DRAMA, which, as Digest reported last week, is in the process of casting for season 2. "So I just had a meeting with the folks from @QueensofDrama,” she wrote on Facebook. "I thought they were really cool people, and I enjoyed talking about their show and what I might have to offer. No matter what happens, I really hope that the women are successful in making their created show a hit. I think that would be so great for them and for all of daytime. I guess I always root for the underdog and I probably always will. @poptv." Buy Cady's autobiography, Murdering My Youth on Amazon!" 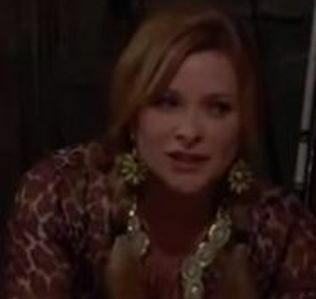 Rumor about Cady joining "General Hospital"
Yesterday was Cady's birthday! Fans tweeted and Facebooked, sent their regards, and she thanked them! Looks like Y&R's new Kelly will be debuting sooner than expected. Cady McClain, who is taking over the role from Cynthia Watros, tweeted, "NEWS FLASH! My first air date is April 16th, not the 24th… so… it's SOON! Yipee!!" GH AND Y&R STARS WED! Jon Lindstrom (Kevin, GH) confirmed to TV Guide that he and Cady McClain, who'll soon be joining Y&R as Kelly, tied the knot on February 14 at a courthouse in Beverly Hills and celebrated afterwards with close pals including Lynn Herring (Lucy, GH) and Kin Shriner (Scott, GH). The couple met playing love interests Craig and Rosanna on ATWT. Our congratulations go out to them! For more details, click here. From Soap Opera Digest Feb 6, 2014: AMC alumna Cady McClain's (ex-Dixie) directorial debut, the short film Flip Fantastia, was accepted into the Macon Film Festival. "It will be showing on the big screen at the Cox Theater in Macon, Georgia on February 27th at the 4:15 short film series," she reports. For ticket info, visit maconfilmfestival.com. In March, McClain will be the keynote speaker at a writer's conference in Kansas City, MO called Write The Dream, and she will also be teaching two classes over the weekend. Called "Dreamscaping," the workshop is about how to dream your way into a story. For more information, visit writethedream.com. Lastly, she tells Digest, her self-published book, Murdering My Youth, will be available on Amazon by March 7 Link. Cady McClain (Dixie, ALL MY CHILDREN; Rosanna, AS THE WORLD TURNS) is self-publishing her memoir, titled Murdering My Youth. And the actress is having a contest in which fans can vote on what the final cover will be! Click here to pick your favorite! What led McClain to join the list of soap stars who've chronicled their life stories? "I was inspired by a woman who asked me to be the keynote speaker at her writers' conference in Kansas City called Write The Dream," she says. "She had followed my blogs throughout the years and offered to help me self-publish this book. Her encouragement was a huge part of me letting this story out into the world. I hope it inspires others to tell their story or at least to not feel so alone with their experiences." McClain will be signing copies of Murdering My Youth at the Write The Dream Conference in Kansas City, MO, on Friday, March 7. Click this link for more information. And as the keynote speaker, she will be encouraging her audience to find their voice via a method she calls "dreaming your way to a great, personal story. It's basically like taking a person's psyche and putting it in the structure of a fairy tale or myth." I am very excited to share with you that I have been asked to be a keynote speaker at a groundbreaking writer's conference. I invite you to come to Kansas City and participate in what is sure to be an enlightening weekend. Whether you are just starting to write or an experienced professional, the process of exploring your creativity via the written word is a thrilling one. There are also classes available on the process of self-publishing. Everything from how to design your book cover, to marketing and promoting your finished book. Please check out the flyer below and consider joining us! Click WRITE THE DREAM to be taken to the conference website! Thank you so much for your continued interest in my work! I truly appreciate it and look forward to sharing an exciting 2014 with you. AVAILABLE FREE TO THE PUBLIC* ON VIMEO NOW! *the film is posted separately with Spanish subtitles. Over 20,000 followers can't be ALL wrong! Cady McClain is a two-time Emmy award winner. She is best known for her roles on "All My Children" and "As the World Turns." In 2012, Cady worked as an associate producer on the multi-festival award-winning film "How We Got Away With It." She was involved in every step of the filmmaking process, from inception to color and sound edit to festival submission and sales. Awards include first runner up for Narrative Feature at the Sonoma Film Festival and Best Thriller at the Bare Bones Film Festival (among many others). Currently the film is slated for distribution. She is thrilled to be creating her wildly popular Suzy F*cking Homemaker videos for "Prospect Park" (the Online Network title for "All My Children"). Cady has worked extensively in film, night time television, and theater. In 2008 she was featured in two independent films: "Soldier's Heart," detailing PTSD in a Vietnam Vet home from the war and "Home Movie," a psychological thriller released through IFC. Other film credits of note include the Hamptons Film Festival award winning film "Alma Mater." Television credits include "Law and Order SVU," "Cheers" and "St. Elsewhere." Off-Broadway credits of note include David Ives' "The Red Address" at Second Stage. For a full resume please visit IMDB. Check out her Active Pitch page to watch her reel or download a resume. Cady has been featured in The Washington Post, The New York Times, New York Magazine, The Daily News, TV Guide, Boston Herald, Time Out New York, Good Housekeeping, McCall's, Times Picayune, The Palm Beach Post, Mix Magazine, Connecticut Magazine, Talent in Motion, The Litchfield County Times Monthly, Soap Opera Digest, Soap Update, Newsday, AM New York, The Sacramento Bee, Brooklyn Papers, Agency, Tulsa World, MidWest Beat, Imagine, Rocky Mountain News, Courier Life, The Jamaica Gleaner, Brooklyn Papers and Country Weekly. See news about Cady's movie "Flip Fantastia"! Cady is back on "All My Children" playing Dixie, which airs on Hulu, iTunes, and on the OWN Channel. She's also engaged to former co-star Jon Lindstrom (ex-Craig)! Cady McClain Joins AMC Reboot! Cady McClain Back to AMC! All My Children is back! I am so excited to be a part of this iconic show. Tomorrow, All My Children returns to YOU. In the show you will find 17 original cast members giving awesome performances along with some stunning new characters that I think fit in seamlessly. You can watch us ONLINE on www.HULU.com/all-my-children starting first thing in the morning tomorrow FOR FREE! It's an exciting time. Won't you join us? Thank you so much for your continued support. It really has meant the world to me. Jon and I both got pre-nominated for a daytime Emmy! Him for lead actor- ATWT and me for supporting actress- AMC. How about them apples! New Music From Cady McClain Now Available! Cady McClain is returning to ATWT as Rosanna. Soap Opera Weekly confirmed that she'll be bringing back Rosanna as the show comes to a close later this summer. Cady is also dating Jon Lindstrom (Craig, ATWT; ex-Kevin, GH and PC)! trips to New Orleans. I hope you will check it out and that you enjoy it! break from daytime for a few months, the door is always open in my mind. If you want to contact either show and let them know how you feel about my work, I would be most grateful. to get it out there in the world. I will be blogging and making art more often now that I have a little more time. You can always check out what I am up to at http://www.cadymcclain.com Thanks again for keeping in touch! 2009-Cady is back on As The World Turns! I hope 2009 is a terrific one for you! I am thrilled to announce that I have finished my second book of poetry and art, "Licked- poems of love (sort of)". I am really happy with this book, and I hope you get a chance to take a peek! It's FOR ADULTS ONLY, please be warned! I sell it at cost, so I'm a typical poet in this regard- making nothing, but I am open to accepting free sandwiches! Check out Cady's ABC blog! She updates it regularly! Thank you very much Ryan Bruce Levy. The film is also being distributed by IFC in the states, so you may very well find it “on demand” or coming to a cable channel near you one of these days! I am indeed very proud of my work in this film. Here is the bad news. Due to personal reasons, a key member of my band is no longer going to be able to play with me. This means I have to cancel a couple of my gigs, as it is too late to find an adequate replacement. Prohibition (this Monday the 21st) and Alphabet Lounge (August 2nd) are out for sure. I am going to try to play Rockwood Music Hall so please hang on to that date… August 15th, 6pm… I will keep you informed! So sorry to disappoint any of you who had made specific plans, but life has its curve balls and I guess one has to go with the flow and hope for the best, right? I will continue to keep you updated on my latest! www.Woozyfly.com has chosen "Cady McClain and Her Band of Married Men" to be filmed for "LIVE AT THE LOFT", to premier on their site! We shoot July 29th at their studios! Whoo Hoo! And here is the latest on our LIVE shows! Thanks to all of you who have come out to support the music. Your incredible energy and excitement is infectious! To those of you outside of the New York area, we hope to get your way soon! Please go to www.eventful.com and let us know about you and where you would like us to visit! music or songs from tens of thousands of other great independent artists. Just click or cut and paste the link below and you’ll be all set! an honor to be among such esteemed company. Sunday, May 18th, at 10am at the Carnegie Institute in Washington D.C.
over the past year. I'm really excited. 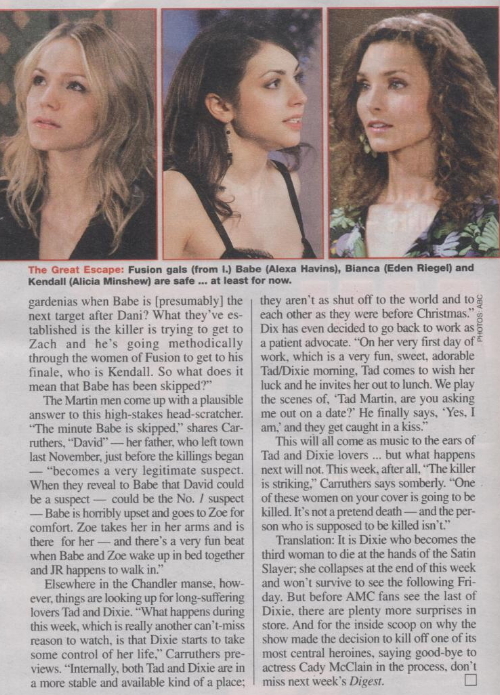 As some of you may know, ABC asked me to return as "Dixie" for a little while, to help resolve the "Kate" storyline. I was very happy to receive the phone call, and hope that it will lay to rest some of the anxiety that has been around that issue. Even though it is only for a limited time, I think that it will be a fun, playful, and ultimately satisfying experience for you, the audience. I start working next week, but the air date is sometime in early May. I hope you get a chance to check it out! Thank you for your interest and support of my work. I am truly grateful. Wishing you a beautiful spring! You wanted it, you got it! Cady McClain returns to All My Children as Dixie Cooney Martin on Friday, May 2. Dixie is back in Pine Valley with a mission: She's reuniting Tad with their long missing daughter, Kate! truth that Kathy is Tad and Dixie's child. hand, Dixie will guide Tad into the loving embrace of their little girl. This is drama you can't miss! According to Cady's blog, she is happy and healthy! She had a fibroid tumor removed in February (they are not malignant). She is vacationing in California and excited about the election. Cady has left ATWT. Below is a letter she sent via the ATWT Fan Club in January. Thank you so much for writing in. I truly appreciate your keeping in touch and your support of my work. It’s been an interesting year to say the least, but I have a feeling 2008 is going to be even MORE interesting! I will be keeping everyone up to date on my latest plans, projects and adventures there. I just finished editing a book of my artwork and poems (the first of three) called “Conversations with the Invisible” and it will be available soon through my website! I hope your New Year is full of fun, love and dreams come true. 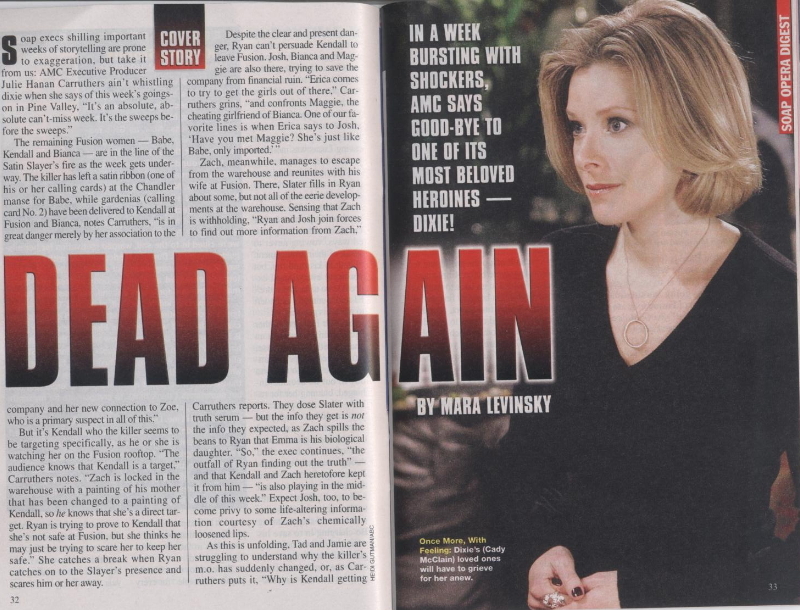 Cady McClain (Rosanna) is leaving AS THE WORLD TURNS, which she addresses in the next issue of Weekly. Might this signal a return to ALL MY CHILDREN as Dixie? Weekly's hot on the story! This was sent out by the ATWT Fan Club via email - they didn't seem to know that Cady was leaving! the letters and comments you have about my storyline. and Craig get back together? Write and let me know. name and home address. Keep in touch. You can also write to me at the studio. A couple of weeks ago, Cady McClain, Rosanna on As The World Turns announced she would be leaving the soap sooner rather than later. On her blog, Cady noted that the show had decided to wrap the Rosanna storyline faster than they anticipated. (You can read that story below). When news began to spread that Cady was leaving ATWT, fans in Pine Valley began to talk about a possible Dixie return. Last February, Cady's Dixie was unceremoniously killed off by Alexander Cambias with a batch of poisoned peanut butter pancakes. Fans were incensed at the time. Now many are hoping that The Powers That Be at ABC Daytime will rethink Dixie's death and bring her back for a Tad/Dixie/Kate storyline. Here is what a few of the Pine Valley Faithful have had to say here. AllForBabe wrote, "In soap land people come back from the dead all the time, so why can't Dixie? The doors are now opened, at least halfway. I hope to God that the AMC powers that be beg and plead with her to get her to return, especially in time for Kate's reveal." Thuud wrote, "I am another whom will be eternally grateful if they bring Dixie/Cady back and do the story justice this time." Ezra511 wrote, "I think the best way to bring her back, is to bring David back, who could have been hiding in PV at the time of her death, have had administered her some medication that would have restarted her heart. (He was a miracle cardiologist remember guys/gals.) I hope with all hopes they are hands and knees to bring her back!!!" K8ecup wrote, "That would be great!! Especially for Kate and plus JR is going to need her very soon when he hits rock bottom!!" A few rumors have begun to circulate that indicate a character may be returning from the dead - and that return will shock many fans. Will Dixie return to Pine Valley to help Tad find their missing daughter Kate? We'll have to watch, wait and see. Cady McClain's Rosanna has only been back in Oakdale, after a two year coma, for a few months but already it looks as if her stay will be short lived. Cady posted in her official blog last week that the "Rosanna" storyline was going to wrap up sooner than originally thought. "I have sad news. [The Powers That Be] are wrapping up the Rosanna storyline early. I was slated to work through February, but the story took a dramatic turn that will alter that plan," wrote Cady on her blog. You can read the entire post here. She went on to write, "I have always been open to all possibilities, even this one, but I will be sad to have to say goodbye so soon." As soon as word leaked earlier this year that Cady was leaving All My Children, fans began buzzing about the possibilities that Cady would land in Oakdale to reprise the Rosanna role. When her first episodes aired early this summer fans were ecstatic. Those feelings cooled quickly, however, when Post-Coma-Rosanna began to seem very different than Pre-Coma-Rosanna. In years past, Rosanna was a strong woman who wasn't dependent on a man for anything. But it became clear very early that she was very attached and dependent upon Paul. Fans thought this was very un-Rosanna like. Kare Bear said, "I couldn't believe she married Paul after hearing him and Meg in the graveyard. Her character was always much stronger than that and it didn't make sense." Several other fans agreed with that statement. A few have mentioned the possibility of Cady returning to her fan-favorite role as Dixie Cooney Martin on AMC. There is no word from either camp about what is next for Cady or the characters she has created on daytime television. On her blog, Cady wrote that even she isn't sure where she will go or what she will do next, but says she is looking forward to the New Year. Soaps.com has not received word when the Rosanna storyline will wrap. We'll keep you all posted on this as the story develops. Whatever the future holds for Cady - and Rosanna! - we wish her only the best. Good luck, Cady! GREAT NEWS!! Cady is returning to As The World Turns as Rosanna!! Check out Cady's ABC blog! On "All My Children", crazy Janet wrote "Dixie lives", so that created rumors about Dixie's return. I hope they don't recast! Check out Soapdom's feature article! Julie Hanen Carruthers explains why she killed Dixie! Take this Soap Opera Digest online poll and choose Dixie, and Tad and Dixie!! Write to All My Children and let them know we want them to keep Cady! Leave your support for Cady on her blog! Please use the banner above to link to our petition or site! I just want to thank you so much for all the hard work and effort and care you have put into this site. I am so amazed when I look around at all the material from so many years that you have collected and organized so beautifully. I am so lucky to have had your time and attention and I thank you from the bottom of my heart. Cady at Super Soap November 2006! Pic from Sarah. NEWSFLASH!! In the July 25th issue of Soap Opera Digest, Cady reveals that she and former co-star Hunt Block are a real-life couple!! I just want to thank you guys so much for all your support this past year. It's been a crazy one! I have been so happy to finish my album of music and finally start to play live! I promise to keep you updated on my where-abouts and goings on as 2007 promises to be FULL of surprises. I hope you keep in touch with me, too! Have a great holiday season and a very happy New Year. Thanks to Jacques for the banner!